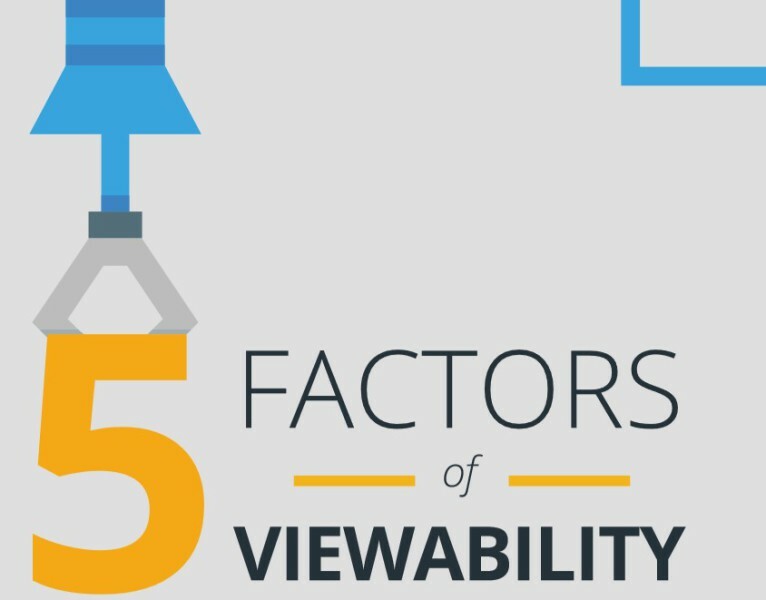 In its recent study published last week, Google identified five factors that impact viewability of online display ads. The factors are 1) State of publisher viewability; 2) Page position matters…; 3) …So does ad size; 4) Above the fold ≠always viewable; 5) Viewability varies across industry. While none of the factors above are very shocking, some of the statistics Google released are surprising. The most controversial stat is that 56% of impressions served on Google display platforms are not seen. Based on Google’s report, here are some key takeaways for marketers to ensure the best viewability for their ads. Firstly, know the industry standard for viewable impressions. A display ad is considered viewable when 50% of the ad’s pixels are in view on the screen for a minimum of one second (according to Media Rating Council). Secondly, pay attention to page position and ad size. Google found hat the most viewable ad position is right above the fold, not at the top of the page. Vertical ad units are the most visible because they are visible for a longer period as a user scrolls up or down a page. Marketers should also be aware of maladvertising: malware that creates fraudulent clicks. If something seems odd in your reporting (for example, hundreds of thousands of impressions but zero clicks), your campaigns could be a victim of this type of fraud. For smart marketers who are paying attention to results, and only spending with publishers who deliver those results, the issue of ad visibility should not be overwhelming. But it is an important factor in our changing marketing landscape in which display ads are recognized as less and less reliable. 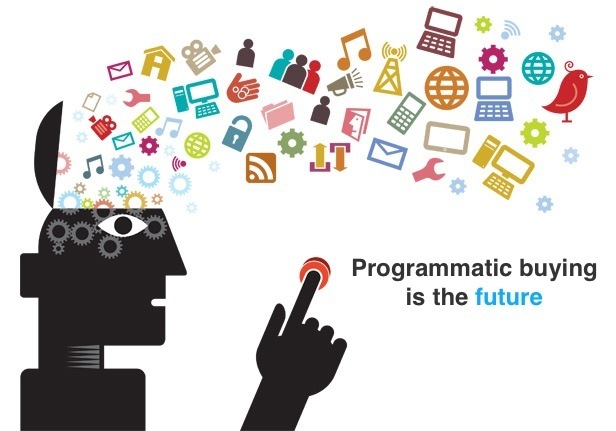 Will Programmatic Advertising Stifle Creativity? On Wednesday, Havas Chief Executive Yannick Bollore spoke about programmatic advertising and whether it threatens to stifle creative output from execs. “Algorithm will never replace the creative director; I’m not worried at all for the future of creativity,” said Mr. Bollore. Despite Mr. Bollore’s confidence that human creativity will always remain at the heart of advertising, Business Insider’s Programmatic Advertising Report claims “Programmatic platforms are on pace to fundamentally reshape the entire digital advertising landscape.” The report found that real-time-bidding (RTB), one of the key components to programmatic buying, will account for over $18.2 billion in U.S. digital ad revenues in 2018, up from $3.1 billion in 2013. There is no doubt programmatic advertising will garner an increasingly large investment from marketers in the coming years, but creativity remains crucial for the success of any campaign. While programmatic may cut out some of the middle men/women who plan, buy and optimize campaigns, it doesn’t replace the human ideas that fuel ad concepts. 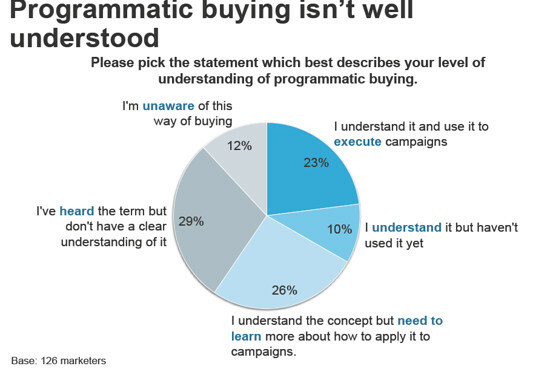 What’s all the fuss about programmatic ad buying? Many marketers are sick of hearing the term “programmatic buying” by now, but it’s still a hot topic in the industry. Programmatic buying is touted as one the most efficient ways to buy online media, both in terms of cost and time. However, there are questions about its value, as cautioned in this WSJ CMO Today article from June 2014. Programmatic buying is an automated way to plan, buy and optimize online display ad campaigns. Settings for the campaign are automatically adjusted based on a marketer’s budget and goals. Real-time-bidding (RTB) is one way to buy ads programmatically, but the term “programmatic buying” encompasses the full spectrum of technologies that allow for campaign automation and optimization. It can be less expensive. Technology will automatically optimize ads based on performance goals set by marketers. The waste is cut out and so is costly manual labor. It’s time-saving. No more hours staring at spreadsheets and manually pulling levers to manage campaign optimization—this is all done through technology. So where’s the controversy? Well, for one, many marketers still don’t understand what programmatic buying is and why it’s valuable, as reported by CMO Today in March 2014. Some marketers associate the term “programmatic buying” with low-cost, auction-based inventory that means your ads will end up in the worst placements (ad placements are cheaply bought, but never seen). With new technologies emerging every day, programmatic buying is much more than just auction-based RTB. Marketers can now buy guaranteed impressions from specific publishers, and even layer in behavioral or demographic data to target the ideal audience. Another challenge is that programmatic buying can leave marketers in the dark about where their ads are placed. This is a big issue for brands who wish to be associated only with specific websites and publishers (and more importantly, who wish not to be associated with others). The lack of transparency has some brand advertisers wary.